As winter fast approaches, you might see a butterfly in the house asking to let her out, but please read this before you do. As most of us start to put on the heating and light fires, there is a chance we will see the peacock butterfly with its spectacular eyes on their hindwings, resting in our homes. Or the reddish-orange tortoiseshell with a ring of blue spots around the edge of its wings, these are the most likely butterflies to take refuge in our homes and sheds before their tiny bodies begin to shut down for hibernation. But late in the year when our homes are heated, these vulnerable creatures wake prematurely and think spring has arrived. But wishful thinking! Outside, the weather is still hostile and nectar is scarce, so what can we do to help? Re-housing the butterflies is the best solution. If possible, gently catch the wee creature and place it in a cardboard box or something suitable and leave it in a cool place for half an hour. Hopefully, it will settle down again. When the butterfly is sleepy, you can take it to an unheated shed or garage or a porch, where it is cool. But remember; make sure it can escape when spring eventually comes. 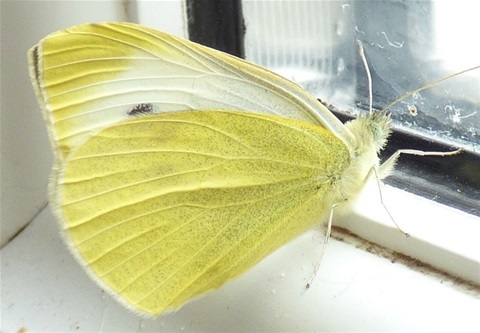 If you have no suitable winter home for the butterfly, then please keep it as cool as possible and release it outside on a fine day. Hopefully, it will find a place to rest before nightfall.